The Trump Cabinet’s Good Opening Week And a reminder of Barack Obama as an inspirer of young Americans. This week was hail and farewell. Thursday morning William Cohen, the former Republican senator who became Bill Clinton’s secretary of defense, introduced and endorsed Gen. James N. Mattis,Donald Trump’s nominee as defense chief, to the Senate Armed Services Committee. “He has the nickname of ‘Mad Dog’—it’s a misnomer,” Mr. Cohen said. “It should be Braveheart.” Sam Nunn, a Democratic former senator, also praised the nominee’s character and credentials. Gen. Mattis is that vanishingly rare thing in Washington, a figure of almost universal respect. His confirmation is expected. The day before, in his confirmation hearings at the Foreign Relations Committee, Secretary of State-designate Rex Tillerson came across as distinguished, calm, informed. In intense questioning, Sen. Marco Rubio was strangely, yippily hostile. “Is Vladimir Putin a war criminal?” Mr. Rubio pressed. 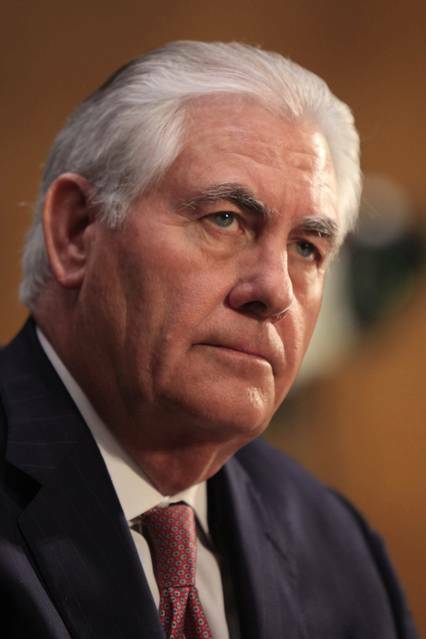 “I would not use that term,” Mr. Tillerson replied, blandly, but with an expression that allowed you to imagine a thought bubble: You can mess with me, son, but it won’t end well for you. In the end, Mr. Rubio did Mr. Tillerson no harm and himself no good. A few hours in, with his accent and cool demeanor, I realized who Mr. Tillerson was reminding me of: former Secretary of State James Baker. It was interesting that all of Mr. Trump’s nominees made clear they would have no problem disagreeing with the incoming president on issues such as immigration, torture and Russia. Gen. Mattis said, bluntly, that he’s “all for engagement,” but we must recognize “there’s a decreasing number of areas where we can engage cooperatively, and an increasing number of areas where we’re going to have to confront Russia.” The nominees’ independence may reassure some of the president-elect’s foes without putting off most of his supporters: They’d expect a degree of dissent among professionals and will want him surrounded by respectful, independent operators. Advice for the new president on his first day—and for the media covering it. Chris Arnade, a photographer whose travels and pictures reveal an America that is battered but standing, a society that is atomized but holding on. In July, South Carolina Sen. Tim Scott told me this was an ‘unpollable’ election. He was spot on. Trump, unlike Romney, understands that ideology isn’t enough to provide the unity America needs. Such hearings are televised in part so interested citizens can form their own opinions. They likely received a generally positive impression. President Obama meanwhile delivered his farewell address, at a semi-raucous and sentimental rally in Chicago. There was nothing terrible in it and little strikingly good. In the tradition of presidential warnings, he spoke of the need to work harder for economic opportunity and racial harmony. We are too divided, sort ourselves out and away from each other, and “keep talking past each other.” We are increasingly stuck in cultural and intellectual enclaves, and choose whatever news we’re inclined to believe. All true. Yet Mr. Obama’s approval ratings are at a respectable 55%. I think I know some of why. I was speaking at a college down South this past fall. The students were impressive, kindly, racially mixed, almost all working-class. An administrator said proudly that most were the first in their families to attend college. In my talk I compared the past five presidents, noting one thing each could have learned, to his benefit, from his predecessor. But the evening ran late, and wanting to sum up quickly I gave Mr. Obama short shrift, not affording him the same degree of regard and respect I’d given his predecessors. The students had been listening and laughing, but here the room turned cool. I knew I’d been unjust but couldn’t turn it around; it was too late to amend. I knew I had disappointed these students, especially, but not only, young black men. They were too polite to say anything, but I felt it. Afterward I thought about it a lot. I had seen that night something I’d missed—what Obama was to the young, especially those who came from families of stress and need. If you were 12 when Obama was elected, and grew up with a mother or grandmother and that’s it, and that mother or grandmother maybe didn’t always treat you so well, and you had no one around to teach you, on a daily basis, how to be a man, show you what a man does, and you saw him acting with careful, conscious dignity, with his intact family and his personal poise—maybe that just meant a lot. Maybe it gave you hints. And maybe when you saw him celebrating those who in whatever way are different, or feel different, that meant something too. Barack Obama had dignity in his personal sphere. He carried himself with confidence, like someone with self-respect. You gathered, as you watched over eight years, that he did what a man does, taking care of his family, his wife and children. He didn’t talk about it but he modeled it, represented it in his actions. This, in an increasingly less parented country, was valuable. I didn’t give enough weight to it until after that night at the college. I put it here to remind everyone, mostly myself, that you can strongly oppose someone politically, really think you’re seeing bad things there, but have a responsibility to see and note what good there is. We’re losing that ability, in our enclaves. He has said that he’s touched a rising generation. To some significant degree I have a feeling that will probably prove true.